For over a year Powys County Councill has blocked every attempt by Hay-on-Wye Library Supporters (HOWLS) to meet with Councillors and provide accurate financial information in order to find a way to keep Hay on Wye library/Llyfrgell Y Gelli Gandryll operating from its current, purpose-built site in the centre of town. As the deadline of December 2017 draws closer for submission of a business plan it is clear that Powys CC has no intention of honouring their previous decision to consider proposals. Likewise, Powys CC is completely ignoring the views of the local community, who want Hay Library to remain where it is and to develop the service. Powys CC intend to push ahead with their plans to move Hay Library into a smaller space in the new Hay primary school and sell off the current Library building and green space. Once again Powys CC has run roughshod over the wishes of local people and will deprive Hay of yet another well-loved community facility. HOWLS asked Hay Town Council to consider taking over the running of the Library building, particularly as they already have responsibility for the car park, public toilets, and the Town Council building – all of which generate an income. After discussions with senior Powys CC officers, Hay Town Council decided not to pursue this option. In an attempt to break the deadlock, HOWLS produced a Library Development Plan to present to Powys CC that would have made the building a self-financing community hub with cafe, offices and meeting space. Hay Town Council was asked if they would form a partnership agreement with HOWLS to help realise this vision. They declined. By the time HOWLS officers finally got to meet Councillor Rachel Powell, the new Portfolio holder for Libraries and Cllr Phil Davis, Portfolio holder for Properties on 15th November (five months after first requesting a meeting), it was clear that decisions about the future of Hay Library had already been taken. Had a partnership between HOWLS and Hay Town Council been in place, there might have had a sympathetic hearing from Powys CC, particularly as Cllr Davies explained how Llanidloes Town Council in his home town had financially saved their Library by transferring it into the Town Hall. The plans to move Hay Library into a smaller space in the new primary school – built with Welsh Government funding – are well advanced. No amount of media razzamatazz about opening a new school, with a library area, will disguise the fact that this is a cut to the library service in Hay-on-Wye. The proposed Hay Library space in the school is smaller, and intended for other uses by the school. Powys CC also plans to half the library opening hours to 12 hours per week. Selling off the current library site is nothing more than Powys CC asset stripping, with complete disregard for a community they serve, in a desperate attempt to sort out its own financial mess. 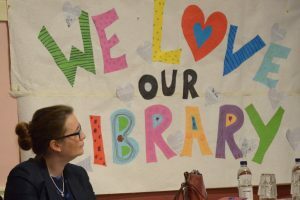 General Election – What does your candidate think about the cuts to library Services in Powys? On the 19 May 2017 Anita Wright, Chair of HOWLS wrote to the candidates standing for election in Brecon & Radnorshire seeking their opinion on the current proposals for library cuts across Powys. At a meeting held on 6th March 2017 at Hay Library, those in attendance agreed to adopt a constitution (with a couple of amendments) and HOWLS formally became a membership organisation. It is hoped that by having a more formal structure we are in a stronger position to negotiate with Powys County Council about the future of Hay Library. If you would like to be a part of ‘Giving Hay Library a Future’ then please sign up here to become a member of HOWLS and we will keep you updated. If you have questions about the new organisation then please contact info@savehaylibrary.org and we will endeavour to assist. THANK YOU TO THE HUNDREDS OF LOCAL RESIDENTS WHO TURNED UP TO SHOW THEIR SUPPORT AT THE PUBLIC MEETING IN JANUARY!